The Australian manufacturing sector has racked up its 13th consecutive month of growth in October, albeit at a slower rate compared to the previous six months. According to the latest survey from the Australian Industry Group, three of the seven activity sub-indexes in the Australian PMI® expanded in October, with new orders (down 0.8 points to 55.1) and sales (down 0.4 points to 51.0) expanding at marginally slower rates than in September. Ai Group’s report also revealed that six of the eight manufacturing sub-sectors expanded in October, with the non-metallic mineral products sector posting a record high of 72.2 points in October driven by the strong demand for building-related products. The input prices sub-index spiked a further 0.4 points to 66.2 in October, indicating elevated cost pressures across manufacturing, especially energy costs. The selling prices sub-index remained in contractionary territory October, indicating mild price reductions as input price rises for energy, dairy and other inputs continued to pressure manufacturers margins. “Forward orders, sales and production are still tracking strongly in food & beverages, building materials and machinery & equipment. Export growth stalled in October (possibly due to the higher Australian dollar in the third Quarter) but the recently lower dollar, which has moved back to around 75 US cents in recent weeks, is likely to see a renewed surge in export activity towards the end of the year,” Mr Willox stated. 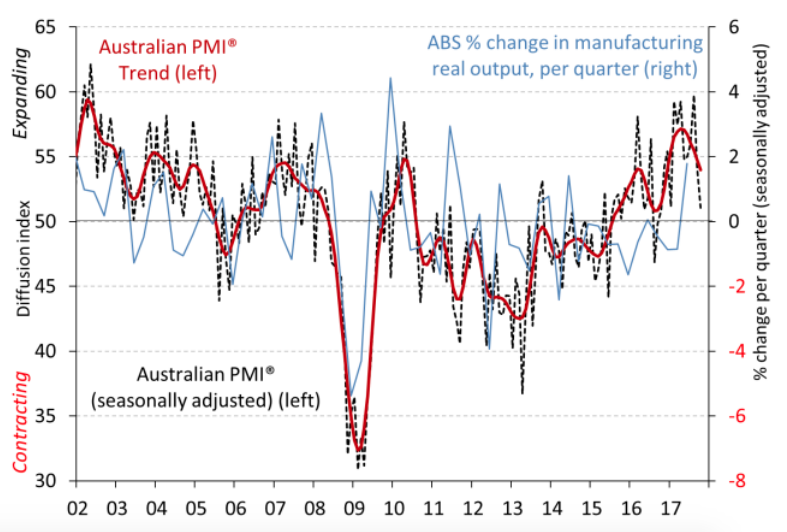 He said October marked the final, historic end of automotive assembly in Australia, which was reflected in lower results (and an absolute contraction) in the Australian PMI® in South Australia. “However, outside of the automotive sub-sector, conditions appeared to be relatively buoyant, if a touch slower, for manufacturers in October,” Mr Willox continued.